People tend to be great at the easy 80% of their conversations. These are the conversations where you deliver ‘good news’ to your team, your manager or your customers or where you are responding to positive feedback. Most of us, however, are NOT great at the difficult 20% of our conversations. These are the situations where the standard of work is less than you expected, where deadlines are not met, where the person’s attitude is negative, where tasks do get done but the way in which they get done causes friction or conflict. Picture ‘Problematic Patrick’. He really ‘knows his stuff’ and is very efficient but …. he’s not a team player and he does tend to ‘rub people up the wrong way’. Picture ‘Problematic Pamela’. She is great with clients, they all love her but …. she’s not well-liked by her colleagues. They find her demanding and she doesn’t keep her commitments. ’Everyone’ knows this is how Patrick and Pamela behave, ‘everyone’ knows it’s a problem and that it causes stress, work-arounds, friction and under-performance. It sometimes even causes people to leave (and it is always the valuable people who leave!). It impacts the culture of your team and the business, and your clients notice this negativity too. People know it but they put up with it, no one does anything about these people and their behaviour.. When you don’t have the difficult 20% of conversations the impact is like a disease. If you go to the doctor when you first notice the symptoms it is highly likely you will be cured completely. If you put off going to the doctor the symptoms get worse, and the disease grows. Eventually you will need to address this, but sadly at that point it may be too late to be cured. We usually know when we should have a 20% conversation, but like not going to the doctor immediately, we usually put it off. We don’t have the conversation because we don’t want to hurt the person’s feelings, or because we are worried about their reaction. We worry that because we feel so frustrated, we might ‘lose it’ when we speak with them. We have tried speaking to them once before and it didn’t work that time, so we don’t want to try it again. The truth is we know we should have the conversation. We know why it will be beneficial to ourselves, to our team and to the business but we are not sure how to have the conversation in such a way that we get the result we are looking for. So, we avoid it. Take a step back and consider your work place. 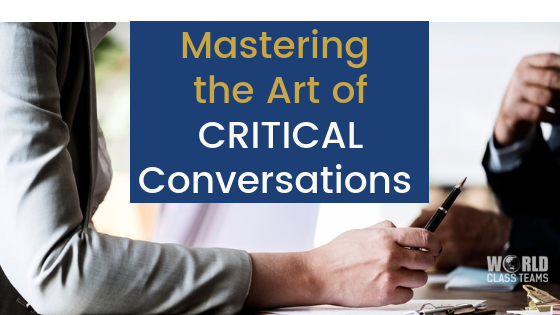 Are people avoiding having critical conversations? Are you putting up with behaviours you shouldn’t? What is the cost of not having those conversations? Is it worth the impact on the rest of your business? And if it not, what are you going to do about it? Places are strictly limited! Get in quickly to secure your seat. Call Ramsina McCully on 1300 085 248 or email ramsina@worldclassteams.com.au for more information.